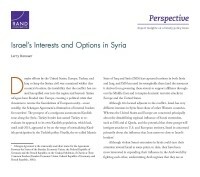 What are Israel's interests, objectives, and policy options in the Syrian conflict? What can Israel do to affect the conflict in Syria? How does Israel view the threat of Sunni extremists, including the Islamic State of Iraq and Syria, in Syria? What can Israel do to affect outside countries, such as Russia and Iran, that are active in the Syria conflict? How can Israel advance its interests in Syria if it has little ability to affect events there directly? With little ability to affect the outcome of the Syrian civil war, and with limited interest in intervening in the conflict other than to pre-empt or respond to attacks on its territory, Israel seems to have been a passive actor in recent events shaping the Levant. But Israel does have critical security interests that it seeks to advance in Syria — principally, minimizing Iranian and Russian influence in Syria, blocking the transfer of advanced weapons to Hezbollah, preventing Syria from posing a credible military threat to Israel or permitting Iran to do so, undermining the legitimacy of Syria's claims to the Golan Heights, and preventing Sunni militants from establishing infrastructure or operational bases along Israel's border. Unless and until the Syrian conflict dramatically changes course, Israel's strategy will likely be to monitor events carefully, work with Moscow to minimize the chances of inadvertent conflict with Russia, and take as few direct actions as are necessary to protect Israel's territory and citizens. Given the unpalatability of the most-likely "resolutions" to the conflict, continued fighting in Syria — a situation in which these various parties continue to focus their fire on each other rather than on Israel — might be the most advantageous outcome for Israel. Israel seeks to minimize Iranian and Russian influence in Syria, block the transfer of advanced weapons to Hezbollah, prevent Syria from posing a credible military threat to Israel or permitting Iran to do so, undermine the legitimacy of Syria's claims to the Golan Heights, and prevent Sunni militants from establishing infrastructure or operational bases along Israel's border. Israel has defended its territory and responded to cross-border strikes, bombed Hezbollah operatives and weapon transfers, provided clandestine support to antiregime Syrians, and engaged Moscow. Israel can block Iranian assistance to Hezbollah by bombing weapon caches and shipments of materiel destined for the group. However, it has little ability to affect events on the ground in Syria, which means that it cannot moderate Iranian or Russian influence, affect the Assad regime's ability to survive, or influence what groups or individuals might succeed Assad. It has focused political, military, and clandestine efforts on keeping Iranian, Hezbollah, and Sunni extremist fighters away from areas close to the Israeli border, where they pose potential threats to Israel security. This research was conducted within the Intelligence Policy Center of the RAND National Defense Research Institute. Hanauer, Larry, Israel's Interests and Options in Syria. Santa Monica, CA: RAND Corporation, 2016. https://www.rand.org/pubs/perspectives/PE185.html.